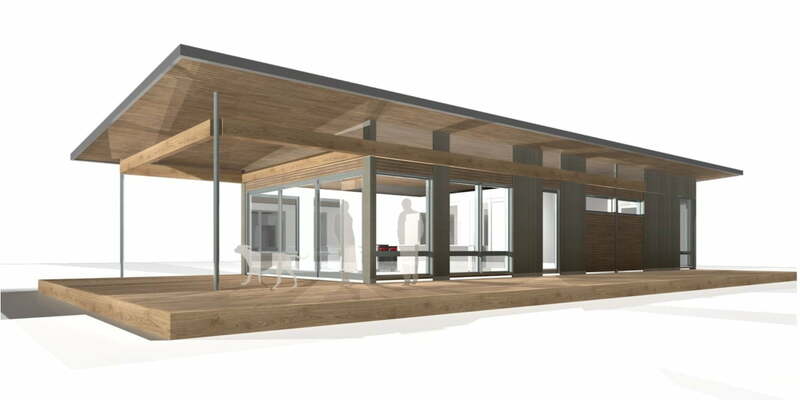 The Kicking Horse by Karoleena is a single level, single module 945 square foot prefabricated home. The home’s modern style features many of the classic mid-century “California Modern” trademarks such as; large spans of floor to ceiling glass, low sloped roof lines and open floor plans. The Kicking Horse Floor plan features an open concept kitchen, dining and living room plan. Two bedrooms and a small, single full bath complete the home. At the rear of the kitchen is a modest-size utility closet for mechanicals or to use as a pantry.